Physically awkward and socially graceless, with a voice only a Canada goose could love, Julia Child was the last person on earth about whom anyone would've thought to say, Oh, that one—she's going to bring the subtle, sophisticated pleasures of French cuisine to the American table. Yet that's what Child and her two French coauthors did, in 1961, with the publication of Mastering the Art of French Cooking—the book that also, arguably, triggered the whole foodie revolution. 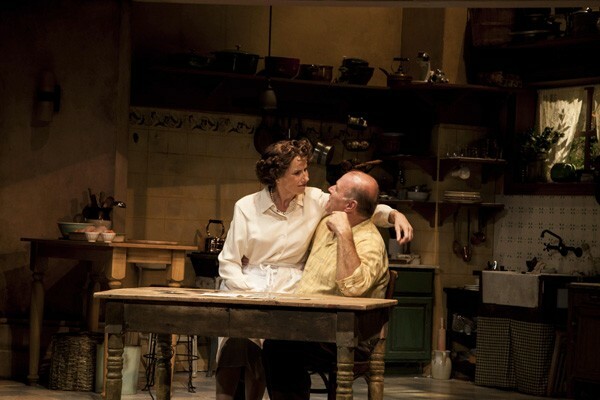 William Brown and Doug Frew's delicious play To Master the Art follows Child's progress from relative hickishness as a new arrival in post-World War II Paris, through a decade-long immersion in la gastronomie francaise, to the eve of her rebirth as a doyenne. Goose voice not withstanding, it's an ugly-duckling story. Child's transformation into a swan is tempered, however, by the parallel but opposite arc of her husband, Paul, who worked for the United States Information Agency, promoting American culture in France. He and family friend Jane Foster Zlatovski both came under suspicion—and, in Zlatovski's case, indictment—for their leftist politics, during the Red Scare of the 1950s. Their counterpoint to Julia's rise gives Brown and Frew's script tension, weight, and context to go with its great good humor. I missed To Master the Art when it had its much-praised world premiere at TimeLine Theatre in late 2010, so I'm grateful to the Chicago Commercial Collective for reviving it with several splendid elements of the original—including the leads—intact. Under Brown's fluent, witty direction, Karen Janes Woditsch's Julia and Craig Spidle's Paul come across, engagingly, as both a perfectly average married couple and entirely remarkable people. Heidi Kettenring has heartbreaking moments as Zlatovski; Terry Hamilton summons up memories of old Droopy Dog cartoons as Julia's mentor, Max Bugnard; and Sam Ashdown makes himself delectable as an American GI turned culinary student on whom Julia would love to gorge. The Building Stage said good-bye, Jamil Khoury said a lot, and other notable moments from the year in theater.